Visitation will begin at 10 AM. Lunch will be served following services in the church hall. Sweet and kind, Betty Wolfe lived a life rich in family and faith. With a heart fueled by a desire to see those she loved happy, Betty centered each of her days on encouraging others to follow their dreams. Generous beyond measure, intelligent, and resourceful, Betty embodied her beliefs and inspired all who were blessed to know her. Cherished by many, Betty’s loving legacy will long live in the hearts of those she loved. 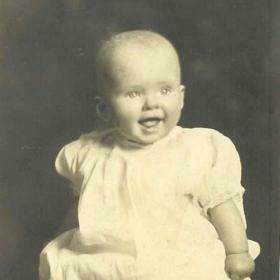 On June 9, 1926, in Detroit, Michigan William “Paul” and Elma (Sherburne) Streeter welcomed their daughter, Elizabeth “Betty” Mae, into their hearts and home. Betty was joined by baby brother, Bill, three years later.  When the depression hit, Paul, like so many others, lost his job with the telephone company. They returned to Lawton and the Holiday farm, where hard times followed. Eventually, they inherited farm land in Lawton where Paul built their home and worked as a farmer and carpenter. Growing up in Lawton in the 30s and 40s, Betty’s life was built on the firm foundation of family, hard work, and resourcefulness. While her father provided for the family with his work as a carpenter, her mother ran the home. Because her mother was challenged with health issues, as the oldest child, Betty had a major role in raising her younger siblings, Sue and John. In addition to caring for her brother and sister, Betty attended Country School where she took her studies quite seriously. When it came time for Betty to attend high school, she moved to the neighboring town of Marcellus to live with her Aunt Ethel. While attending Marcellus High School, Betty met fellow classmate, Irvin John Wolfe, when they “fought” over a classroom typewriter. Instantly smitten with one another, the pair were soon an official couple paving a road that would span over 65 years. 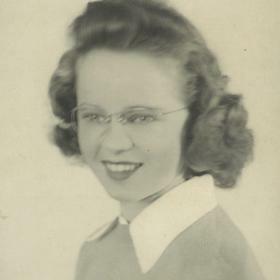 Betty graduated in 1943 just as she turned 17. Having tackled her studies with discipline, she proudly graduated as Salutatorian of her class. Leaving before graduation because of WWII, Irv began his military service with the Marines. During his three years of service, the young couple stayed connected through letters, and their love continued to grow. While Irv was away, Betty earned her cosmetology license and then worked the remainder of the war years in a factory in Lawton. Upon Irv’s safe return after the war, he and Betty married on October 19, 1946, in Marcellus with a celebratory reception in the Hudson Memorial Building. Betty and Irv first made their home in Cassopolis. 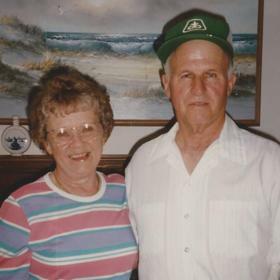 After working at his father’s foundry and for his father-in-law as a block layer for a time, Irv and Betty chose to follow their dream and purchased a 50-acre grape farm in the Marcellus area. There they raised seven children from 1956-1967. In 1967, they bought a larger farm in Lawton and moved the family there. While Irv did the heavy physical work on the farm, Betty managed the home. She ran the books, kept the home, and raised the children. Creative, resourceful, and frugal, Betty mastered stretching the family’s resources and each dollar they had. She lovingly tended to the garden, growing a robust bounty she often canned. She sewed playwear, dresses, skirts, prom and wedding dresses. Her cosmetology training provided many hair cuts and perms for the family and relatives. As a result of Betty’s resourcefulness and Irv’s hard work, the family was pretty much self-sufficient. Without a doubt, Betty’s children were her joy. Singularly motivated by her desire to see them happy, Betty worked every day to build a home that was rich in love, support, and tradition. She was a very encouraging mother and often told her children, “As long as you’re happy, I am happy.” Betty relished in creating the meals that gathered her family together. She was a great cook, and her fried chicken, pot roast, and turkey were unrivaled! A firm believer in the importance of an education, Betty always encouraged her children’s learning and supported all of their endeavors to stretch and grow. She also showed her children how a good woman cares for her husband and family. As a deeply devoted and loyal wife, Betty’s heart willingly served as the compass for her 62-year marriage. Talented in many ways, Betty grew a fantastic flower garden; she just adored her iris. With a gift for quilting, Betty passionately stitched every baby, graduate, and bride and groom a cherished treasure that will long envelop them with her faith and love. Many of Betty’s days were filled with music. 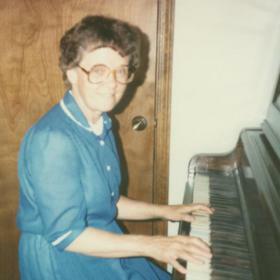 She was accomplished at many instruments and often filled her home with the beautiful tunes she played on the piano, accordion, keyboard, guitar, banjo, and dulcimer. When she wasn’t making the music herself, she loved getting together with others to play, like sisters Sue and Mary, cousin Al and gang, or sister-in-law Elsie and brother-in-law Frank—whomever was game to make music. Later, when lifting an accordion or holding a guitar became too much, she enjoyed listening to country music and gospel hymns on CDs. Betty possessed a deep intelligence and was very much a lifelong learner. She especially enjoyed the challenge of working the daily newspaper’s crossword puzzle. In June of 2016, Betty moved to the White Oaks Assisted Living in Lawton where she lived the rest of her days in good humor and with unwavering kindness. Though the world is surely duller in the absence of Betty’s bright light, her vibrant legacy will continue to brilliantly shine in the hearts and lives of those she leaves behind. Betty Wolfe, age 91, died on Saturday, March 3, 2018. She was born June 9, 1926, the daughter of William Paul and Elma Streeter. 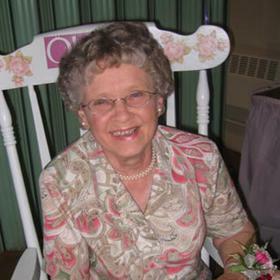 Members of her family include her 6 children Suzanna (John) Tudor, Shirley (Joel) Nelson, Bill (Connie) Wolfe, Duane Wolfe, Patty (Jim) Buller, Penny (Mark) Boven, 17 grandchildren and 27 great-grandchildren, and a brother John (Tina) Streeter. She was preceded in death by her husband Irvin, her son Ray, and her 3 siblings: Bill Streeter, Sue Streeter, and Mary DeVries. Cremation has taken place and service to celebrate her life will be held Saturday, April 28, 2018, at the Lawton Evangelical Mennonite Church. Visitation will begin 10 a.m., service at 11 a.m. Food and fellowship will immediately follow services in the church hall. 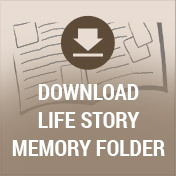 Please visit Betty’s personal memory page at www.BetzlerFuneralHome.com where you can read her life story and archive a memory or photo. Memorial Contributions may be made to the Lawton Evangelical Mennonite Church. Arrangements by Betzler & Thompson Life Story Funeral Homes, 60900 M-40 Highway; Paw Paw (269) 657-3870.